All throughout my life I never really knew anything about my family history. I guess I never bothered to ask because I figured it wasn’t important. I’ll never forget though, about my ex’s grandmother. Everyone fondly called her “Nana” and she was the true matriarch of the family. I loved that woman. From the first day I went to one of their family functions she was so welcoming and friendly. She was also really heavily into researching her genealogy and she had huge white binders all alphabetized and filed by date in her sun room. She worked on it for years, and this was before the internet. I always respected her for all her hard work. It would be amazing to see if she had access to the internet and what progress she would have made then. 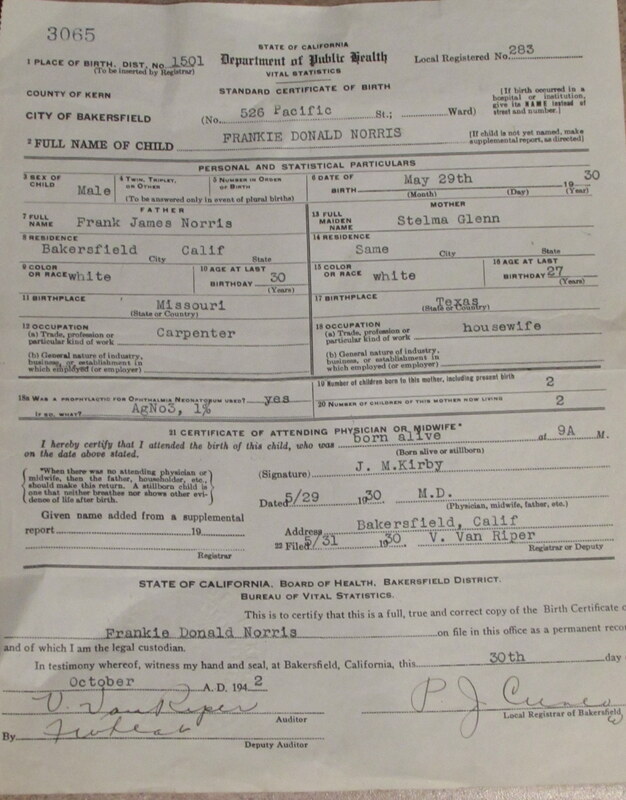 All I knew about my family was that I am distantly related to Chuck Norris on my dad’s side, and that on my mom’s side our family were prominent members of society in the early development stages of the City of Torrance. That’s pretty much about it. 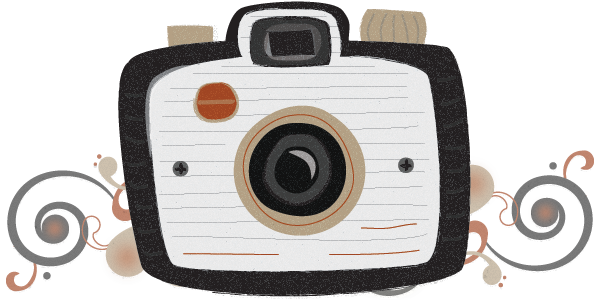 It wasn’t until after my mom passed away that I inherited boxes and boxes of old family photos and items which inspired me to try to piece together whatever I could about my mom’s side. My father’s side though, I thought would remain a mystery indefinitely. Mainly because he has long since passed on, my two half brothers never speak to me and I wasn’t sure about the whereabouts of my step mother. Well, since she recently came back into my life I have had the rare opportunity to get these unanswered questions finally put to rest and all I can say is wow..! You know that question that is asked “If you could go back in time and confront your younger self what one thing would you tell him/her?” Mine would be “ASK MORE QUESTIONS” I never realized how important knowing all of this was to me. It’s strange enough picturing your parents as kids, let alone having the same rebellious nature that every other kid goes through while growing up. Dad was the high school ‘babe’. He has signatures in his yearbook from multiple girls that say “To a swell guy!” and “Have a great summer Casa Nova!” before he was a heartthrob though, he was born in Bakersfield, California to his parents Stelma and Frank Sr Norris. The name on his birth certificate is actually “Frankie” Norris.. hehe! Grandpa Frank was a carpenter by trade, and my grandmother a housewife. They settled in Bakersfield in 1923 and bought several hundred acres of land for mining purposes. I’m not quite clear how long they lived there, but what I’ve found out so far is before they moved to Torrance they sold all of their land except for ONE (1) acre. This land sat in our family untouched (but taxes kept current) for maybe upwards of 70 years. When my grandparents passed away, the land was supposed to have been split between my dad and his brother Jack (I think I only met my uncle once or twice and from what I recall he was really nice) Since being in contact with my step mother she told me about the family land (news to me). She’s had the original deed all along and has been the one paying the yearly taxes on it. She wanted to transfer it to me if I wanted it and said she’d get the quit claim deed drawn up and notarized ASAP. Of course I said I would love it. After all, it’s been in this family for this many years and the fact my grandparents SETTLED there in the 20’s makes it all that more priceless and sentimental. I’d like to ultimately pass the land to my nephew so he can keep it and pass it on to his kids. 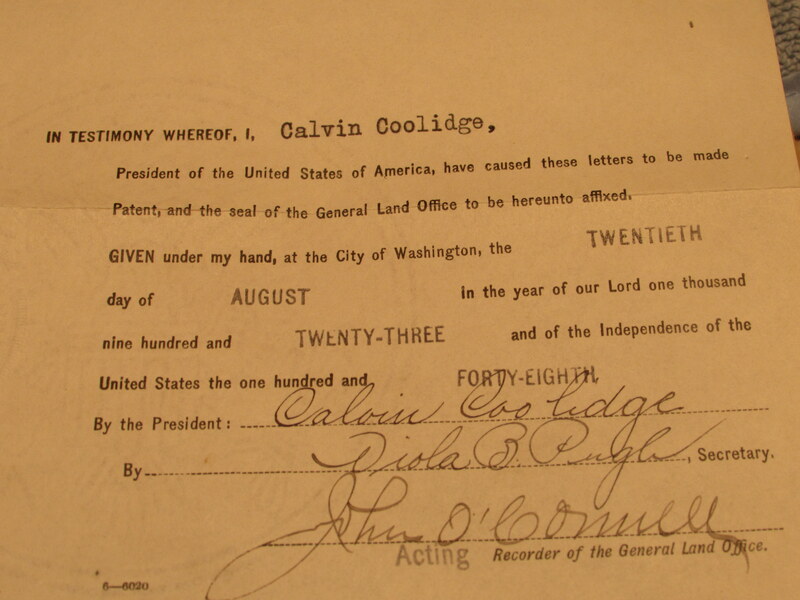 Also, how cool is it to have a deed that’s signed by President Calvin Coolidge? For a piece of paper that’s so old, it’s in damn fine condition.